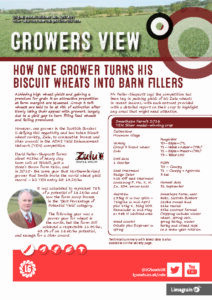 Zulu is a high yielding soft biscuit winter wheat that was added to the AHDB RL in 2014. It is robust with good all-round agronomic characteristics and good grain quality. Zulu has attributes that growers and end users require in a biscuit variety and is suited to a range of markets including distilling, making Zulu ideal for growing in Northern parts of the UK and Scotland. Zulu would not appear to be a significant step-up in yield compared to several of its competitors. However, Limagrain believe the variety has a sound agronomic package offering growers similar security to the old favourite Claire, but with the advantage of OWBM. Zulu carries resistance to SBCMV. Although the distribution of this disease is low in the UK, incidence would appear to be increasing, and variety resistance is essential for growers in the regions affected, to guarantee good crop returns. Zulu offers very good physical grain characteristics, making the variety potentially suitable for the key market outlets; biscuit, distilling and export. Zulu has all of the attributes growers require in a biscuit variety, a sound variety on-farm, with good agronomic attributes and a range of market outlets for the grain. Technical information for Zulu is below. All data is from the AHDB Recommended Lists 2019/20 database. See www.cereals.ahdb.org.uk for full dataset. On the 1-9 scales, high figures indicate that the variety shows the character to a high degree. Y = Suited to that market, (Y) = May be suited to that market.